ABOVE: Cheryl snapped this picture from our breakfast table on River Countess. 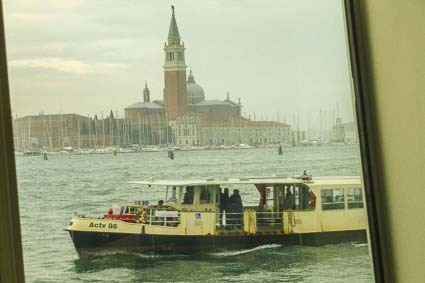 It shows a vaporetto or water bus passing the ship at close range, with the island church of San Giorgio Maggiore just beyond. INSET BELOW: Cruising past the Campanile di San Marco and the Doge's Palace, taking photos during the cruise to Chioggia, watching a tourist cop a coppery feel at Juliet's house in Verona, and Uniworld's signature "Do Not Disturb" pillow on a cabin door. The ships and cabins are compact, the number of passengers on board is small (100 to 150 on most European river vessels), and the focus is on port visits and sightseeing--usually with shore excursions included in the fare. In many ways, a river cruise is like a group tour, except that you aren't being driven to a different hotel and restaurant every night. Also, cruise itineraries vary in their ratio of cruising to sightseeing. On a river like the Rhine or the Danube, you might cover several hundred kilometers a week, crossing several countries' borders along the way. A River Countess cruise is at the opposite end of the spectrum: The cruising distance between one port and the next is seldom more than two or three hours, and you'll spend several nights moored in Venice or Polesella (or Chioggia, if conditions prevent the ship from reaching the Po River, as they did on our cruise). You'll also spend more time on buses than you might on, say, a River Baroness cruise from Paris to Normandy and back, because the ports--except for Venice--are mostly jumping-off points for visits to interesting cities in the region. You're no longer a first-time river cruiser, and you're ready for a different type of cruising experience. You'd like to combine a roundtrip cruise with a vacation in Venice. You want to get a taste of important cities in Northeastern Italy without transportation hassles or overnight stays. As we mentioned earlier, Uniworld's River Countess ranked No. 1 among all cruise ships (including river and oceangoing vessels) in the 2013 Travel + Leisure World's Best Awards. Uniworld has also raked in awards from Condé Nast Traveler, Saveur, CruiseCritic.com, Zagat, and Travel Weekly, so you're likely to be delighted by your experience on board. Bottom line: If you like upscale small-ship cruising, don't mind a few bus rides, and take pleasure in sightseeing, you'll probably enjoy a cruise on River Countess--especially since it includes the magical atmosphere of Venice and the Venetian Lagoon.